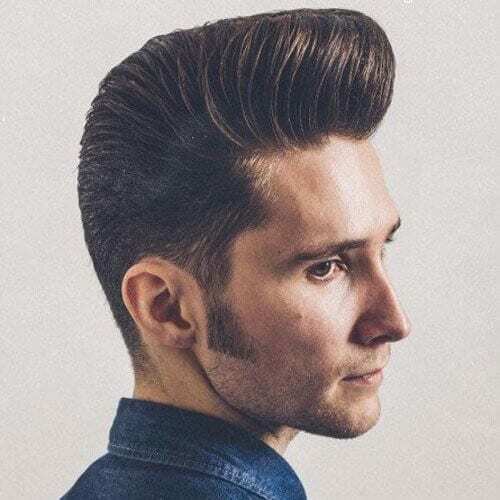 From the greasers of the 50s to A-list celebrities of the present day, the pompadour haircut has proven to be nothing less than a style icon of its own. 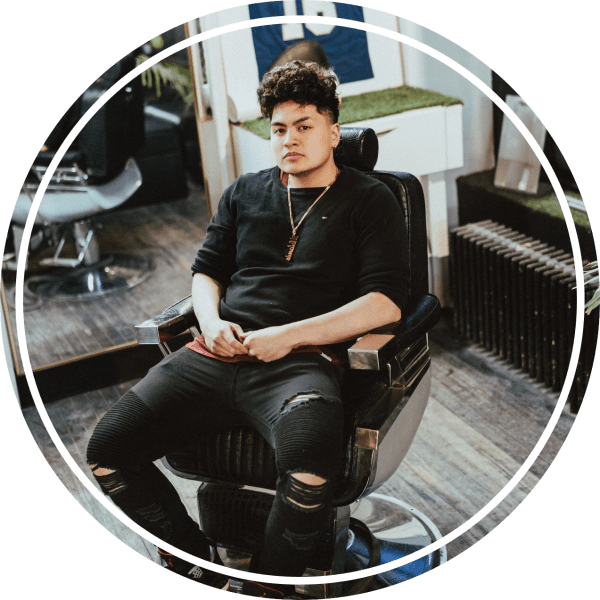 Rocked as a statement since as far back as we can remember, the pompadour is part of the signature look of personalities from James Dean or Elvis Presley to Bruno Mars or Justin Timberlake. If you’re mulling over the timeless pomp, take a look at some of our favorites for inspiration. Looking for something flashier? Don’t forget to check out our lists of modern pompadours and of the flashiest pomps we could find. It’s only natural that we would visit the roots when talking about an era-specific haircut. As far as the pompadour haircut is concerned, it deserves an accurate representation of the retro times it represents. Use this example if seeking inspiration in this direction. Most of the time, you will see pompadours with straight hair or locks that are styled to reflect this texture. 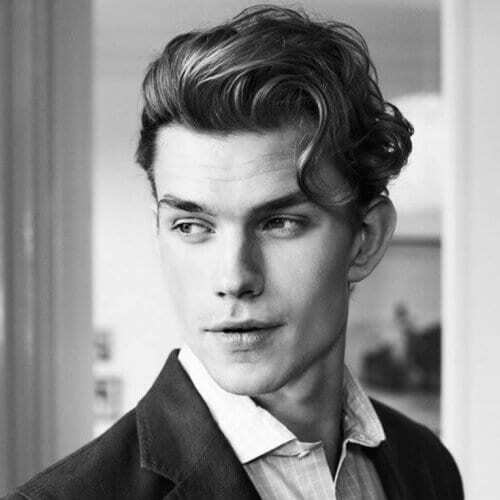 Nonetheless, you can easily adapt your style to your hair type with a curly pompadour. Keep it messy to get that cool effect. Although the pompadour generally maintains the same silhouette like it had back in the day, there are still a few significant differences. For starters, modern versions of the pomp include messy or careless styling. One part about pompadours that inspires us time and time again is how well they work with facial hair. 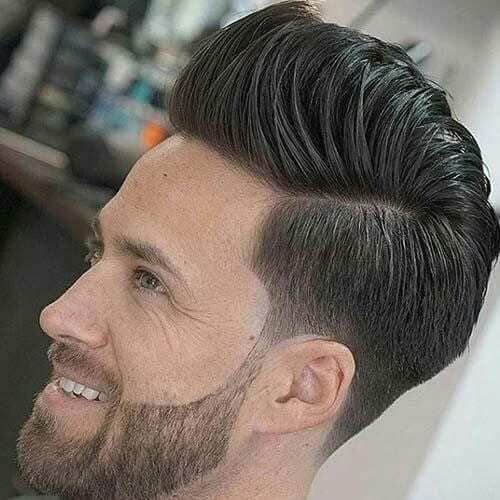 As opposed to other retro hairstyles for men that look nice only with a clean-shaven face, a pompadour perfectly pairs with a beard. 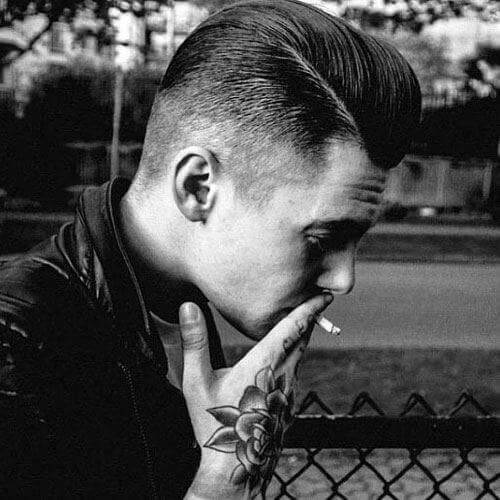 Speaking of modern pompadours, another common trait you will often find is the undercut. 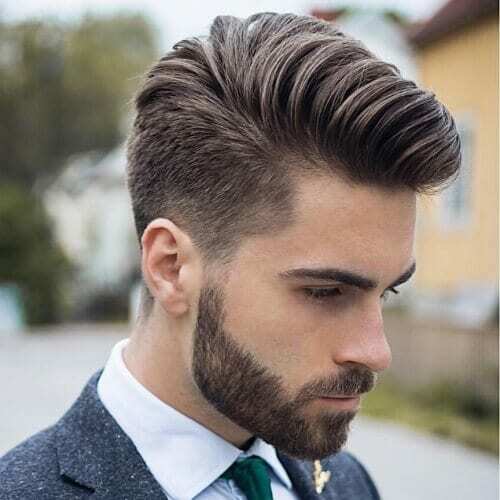 Numerous men prefer keeping a pomp-inspired top with longer hair and shaving the rest down. We will talk about several ways to do so throughout our list. 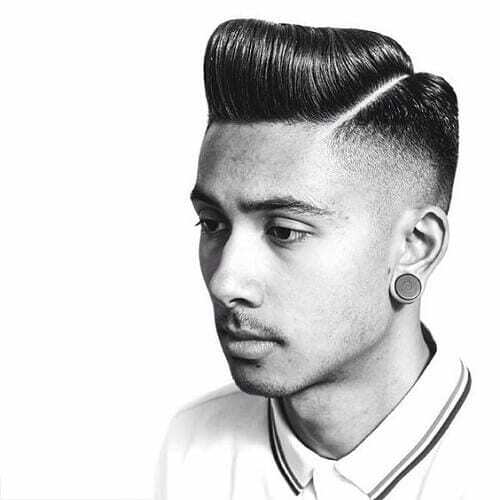 As promised, here is one of the most popular ways to rock a pompadour with an undercut. 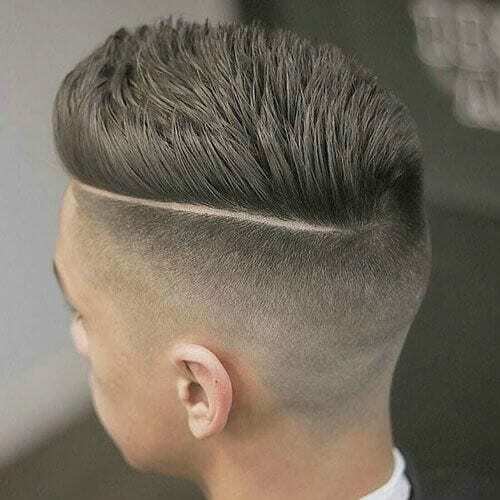 Barbers classify this haircut as a medium taper fade, owing to the gradual technique of shaving down the hair on the sides and back. 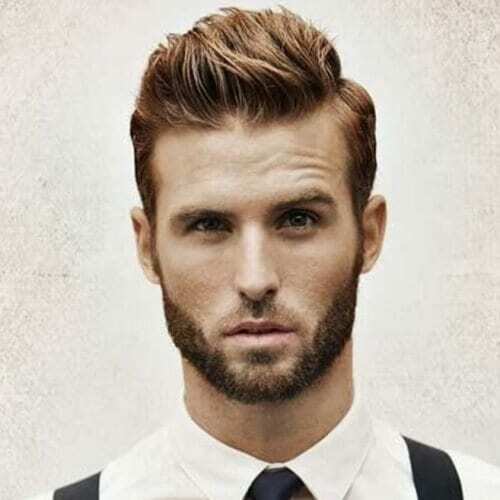 Want to nail the dapper vibe that naturally comes with a pompadour haircut? You need to focus on styling. 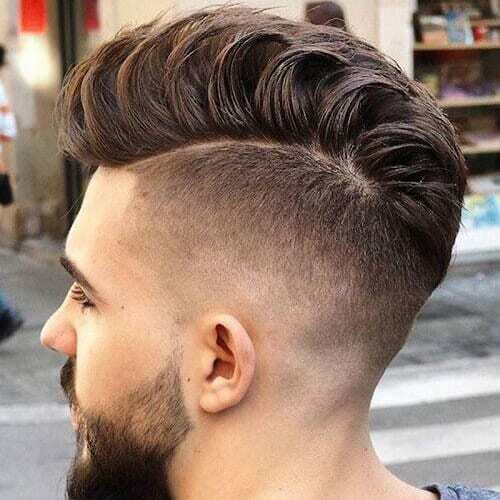 Invest in a top quality hair product and work your way to the shape that best defines your personality, such as this angled approach. 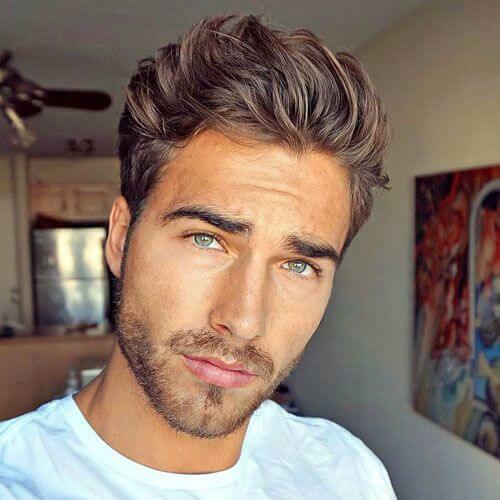 Typically, pompadour haircuts are worn by men that have at least a few inches of hair on top. However, that doesn’t mean that you can’t get this haircut if you have shorter locks. In fact, it results in a refreshing and youthful look. After covering the balanced medium fade, we’ll take a walk on the wild side with a high fade. Like you can expect from the name, this pompadour haircut involves more drastic shaving, usually almost to the upper sides of the head. 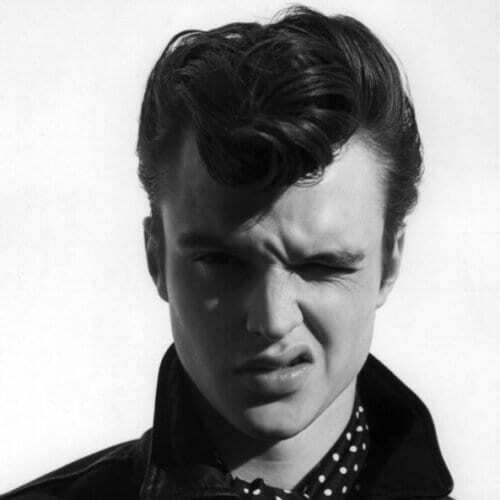 Remember what we said about messy styling for pompadours? Never forget this idea when rocking a super cool modern pompadour. Not only will you get an effortlessly stylish hairdo, but you’ll also enjoy that rock and roll bad boy vibe. 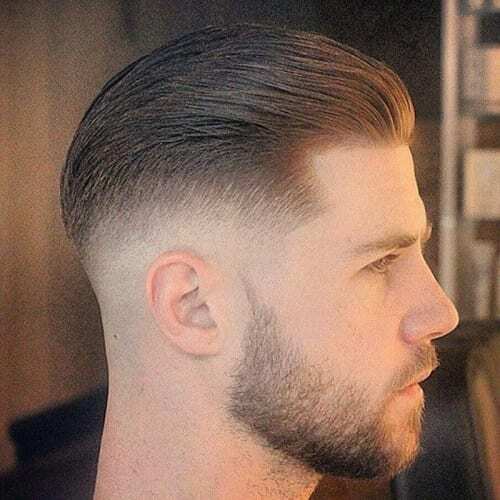 If you’re all about subtlety and class, you should consider a low fade to go with your pompadour haircut. While it indeed involves shaving the lower part of your hair into an undercut, it’s a far less drastic approach with smooth results. We’ll get more into the idea of a classic front curl pompadour below, but let’s ease into the topic with this hairstyle. 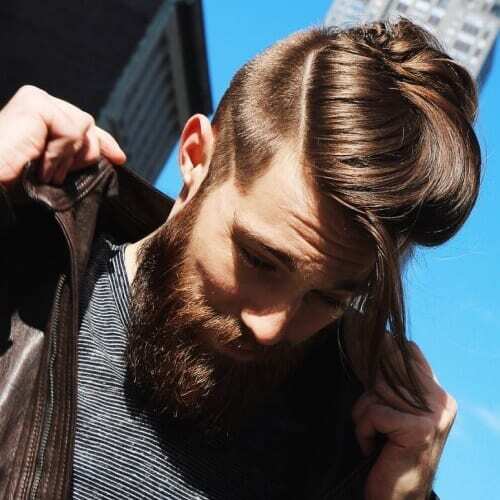 To get this look, your pompadour haircut should include plenty of smartly-trimmed layers. After that, it’s all about brushing and styling inwards. 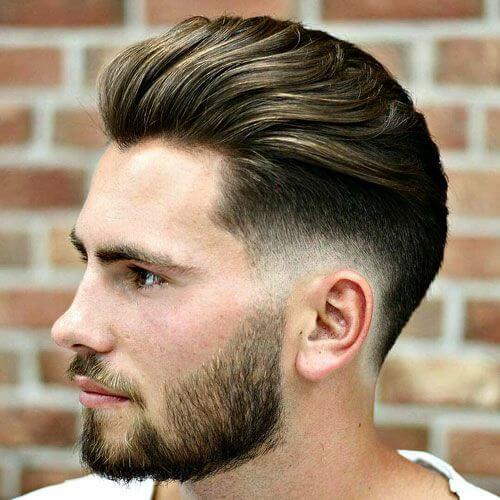 We mentioned that the majority of pompadour haircuts involve a few inches of hair, but you can feel free to let yours grow even longer. In fact, we actually recommend this detail if you want to touch on the rebel without a cause idea. 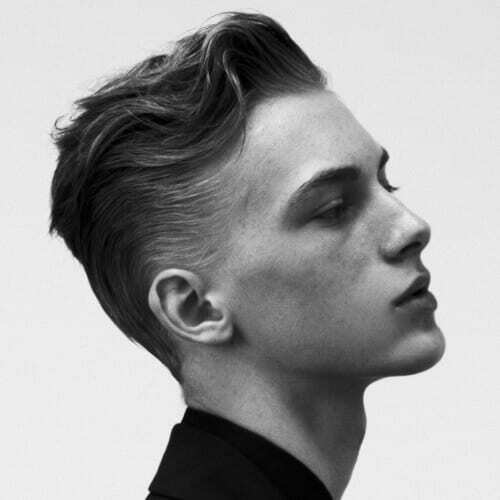 Are full undercuts not your thing? Well, the best solution for you is a taper pompadour haircut with shaving down the sides and back. In contrast to traditional undercuts, it does not involve shaving your head entirely but rather shaping the hairstyle. If you do decide to opt for an undercut with your pomp, however, here is a detail that can boost the impact of your appearance. 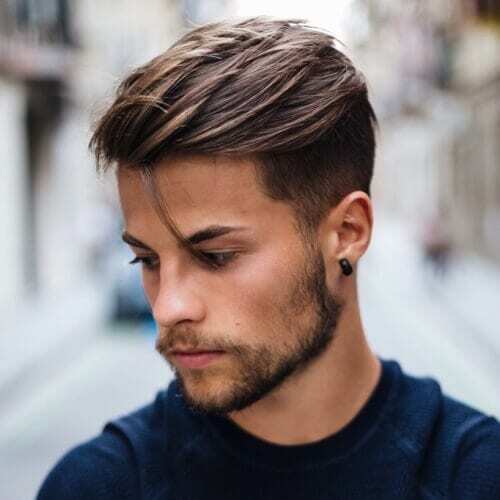 We always bring up hard parts when talking about modern hairstyles, for the sharp definition they provide for any haircut. Are you all about dynamism when it comes to your hairstyle? You should always keep a textured approach in mind. 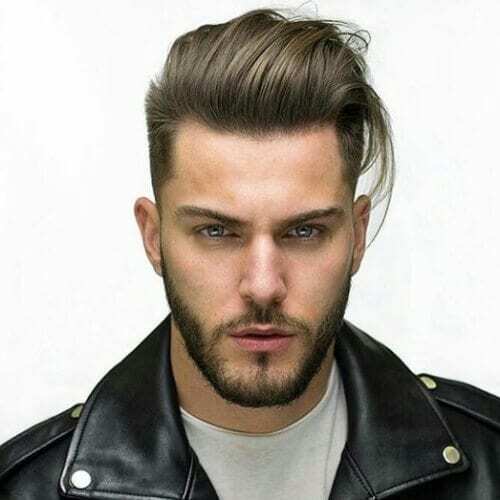 To put it shortly, textured hairstyles for men are based on elaborate layering, making the whole haircut really come to life. We’re back with the effortlessly cool look with this pompadour haircut. This example isn’t accentuated with excessive styling or product in abundance. Quite the contrary; it opts for a natural take on this sleek hairstyle as if you just raked your fingers through your hair. Have a bad to the bone attitude that you want to bring forward through your style? Consider creating a fusion of hairstyles that will help you reach the edgy outcome you’re looking for. 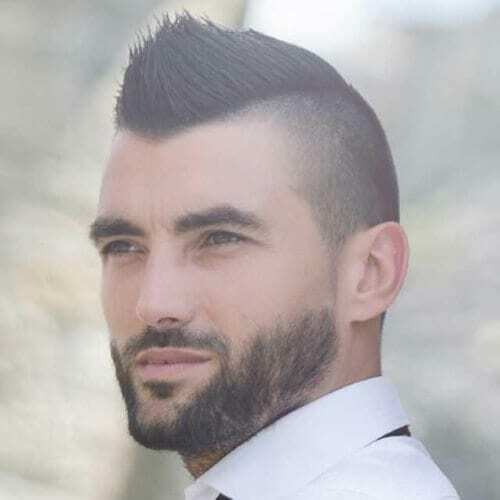 Just an example is mixing a pompadour haircut with a mohawk. 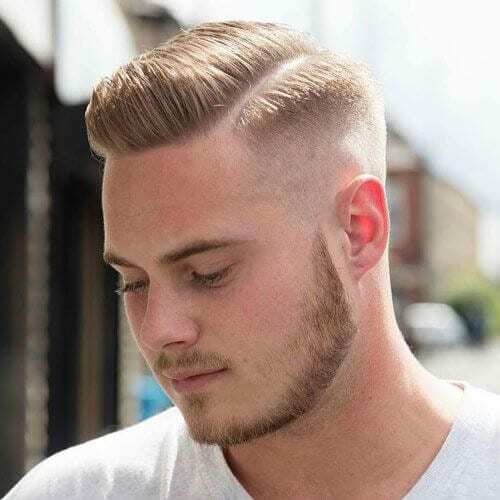 It may seem redundant to associate a pompadour haircut with brushed up styling, but the wide variety of modern alternatives now available leads us here. 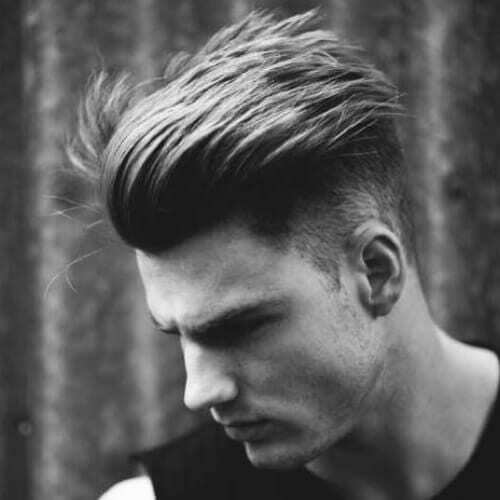 With this entry, we want to highlight the brushed up aspect of the hairstyle, raising our glasses to the classic pomp. 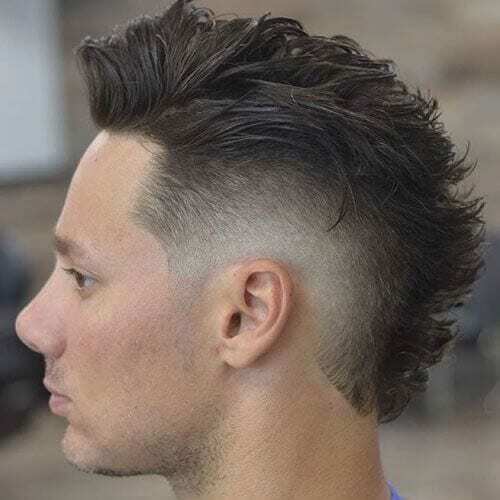 For men who don’t want the fully-rebellious mohawk, faux hawks are always in order. You can get a pretty similar result if you style it properly, especially if you allow yourself to be inspired by pompadours. Blending hairstyles is and always will be key. How can one not appreciate the classic, decade-defying front curl pompadour haircut? 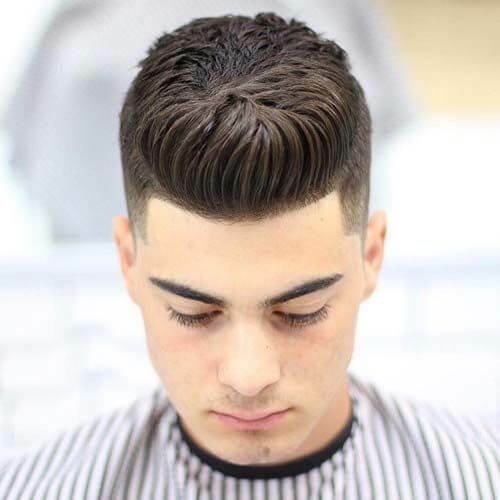 First popularized in the 50s and 60s and with a massive comeback in the 80s, the front curl pomp will always remain an iconic hairstyle for men. If the front curl isn’t genuinely your style, you can tweak it to a hairstyle like the one in the photo above. Think about how a wave looks and adapt your styling to match a similar shape. 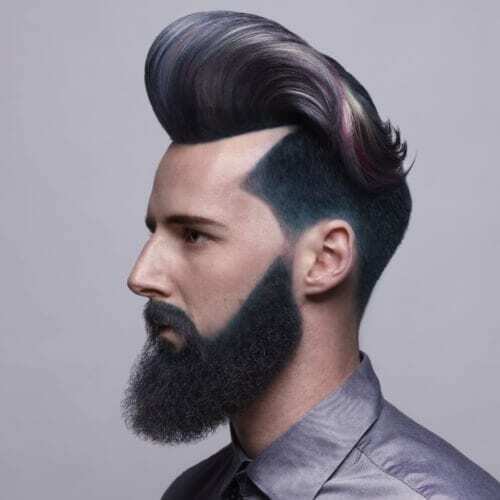 You will enjoy a truly eye-catching pompadour. 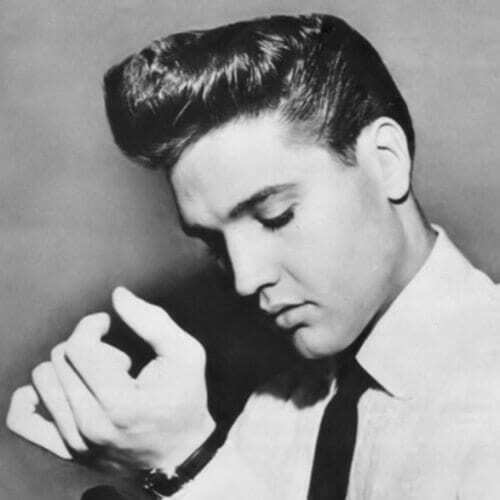 We couldn’t have talked about the pompadour haircut without bringing up the King of Rock and Roll himself. Elvis Presley was undeniably among those who made the pompadour haircut so iconic in the first place, so his take on the hairstyle definitely deserves a spot on our list. Another hairstyle you can combine with the pompadour is the flat top. Traditionally a military hairstyle, the flat top can serve as a stylish foundation for your fusion hairstyle. 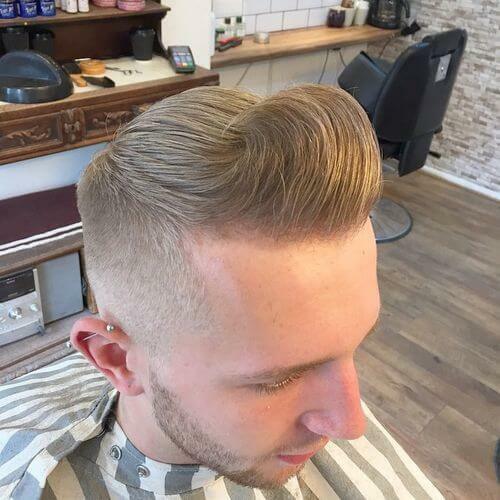 Mix flat top and pompadour styling for a unique look. As far as the pompadour is in discussion, style is everything. Even though you can play around with any approach, you have to consider aspects like length and texture. If you have straight, longer hair, stock up on the hairspray and test this look out. 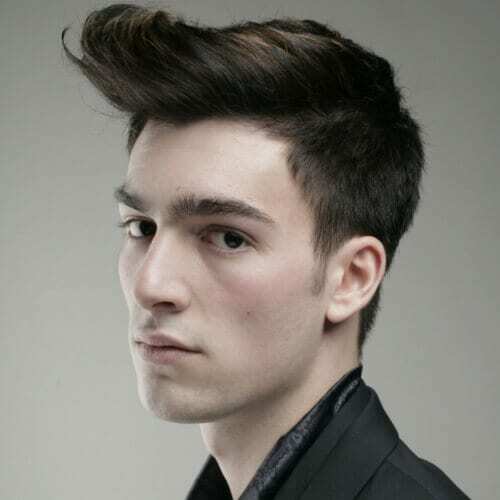 For this example, we want to show how you can mix a quiff hairstyle with a pompadour haircut. The two elegant hairstyles go hand in hand, so you can take elements from each with ease. All you have to do is comb your pompadour over. On the other hand, you can decide to comb your hair back for your pompadour haircut. If you decide on this method, we recommend maintaining the slight brush up in the front that makes the hairstyle stand out. Rock it with confidence. 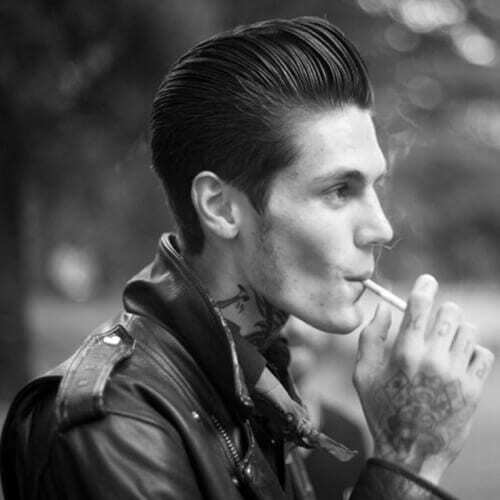 We have previously spoken about wearing a pompadour with longer hair. 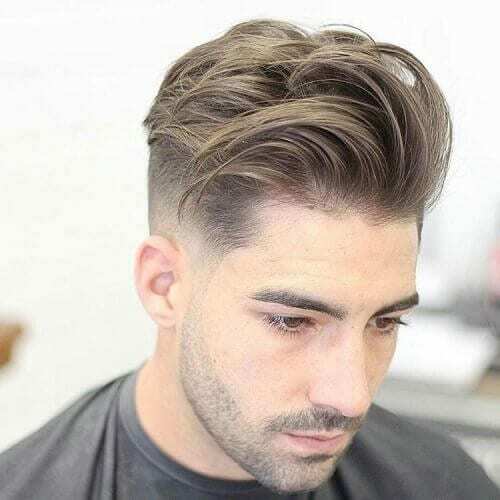 Although this version strays away from the pompadour contour we are used to, it’s a contemporary alternative for those who want to add a personal touch to their haircut. With modern hairstyles, anything goes. That means that you can take the pompadour and truly make it your own through original styling. Push your limits with this brushed up and flat fashion, which also boosts the volume of your hairstyle. 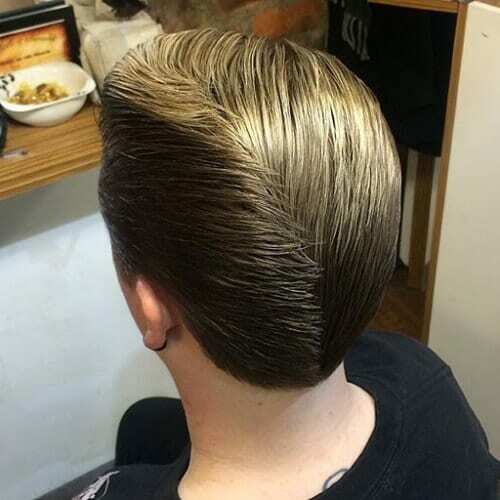 We’re back to basics with this pompadour haircut, which absolutely glows with rockabilly style. In a nutshell, it’s the staple hairstyle that accompanies the rockabilly movement. It shows how music and fashion will always be closely associated. Nothing compares to the expertise that a professional barber can provide for men’s grooming. 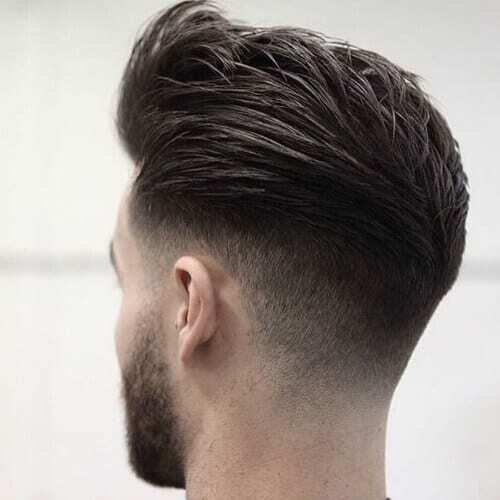 A popular barber shop haircut is the temple fade, which actually works magnificently for shaping a pompadour hairstyle. 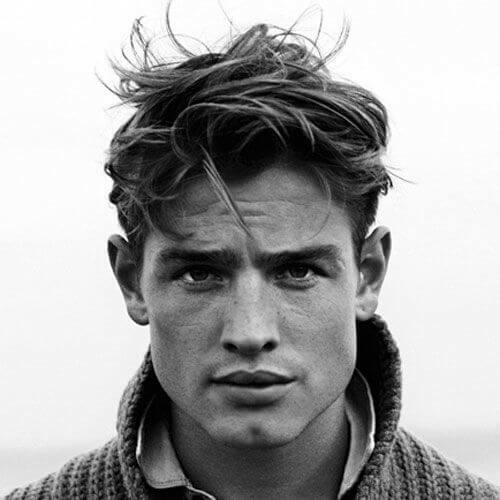 We have covered pompadours for men with straight and curly hair, but what about those with naturally wavy strands? You will enjoy more dynamism than ever if this is your hair texture, with a wavy pompadour that will make heads turn after you. There’s no doubt that layering can lead the way to an outgoing and unconventional haircut for men. 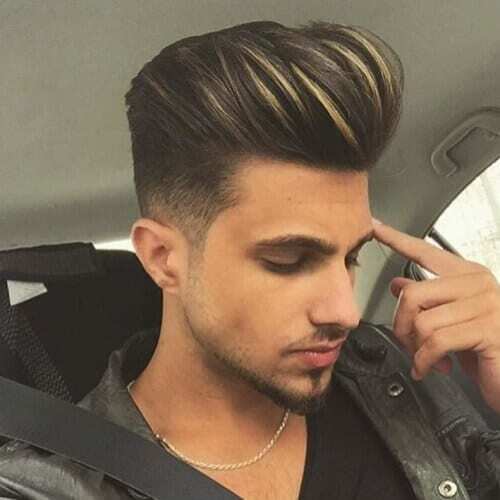 No matter what type of hair you have, trimming it in layers adds to the personality of the hairstyle. The same goes for layered pompadour haircuts. We know by now that a pompadour haircut with a beard results in a dreamy appearance, but what if you opt for an intriguing mustache? 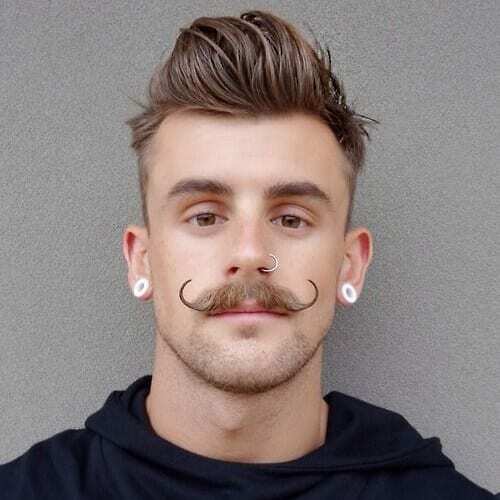 Rest assured, as this style of facial hair is just as compatible with the timeless pomp. Want to get that laid back look without adding a ton of product to your hair? You can skip slicking back and trade it in for sweeping back. To put it otherwise, use just a bit of product and focus on styling the strands in place flawlessly. We all know that spiky hair has been trending for the past few decades now. Still, we don’t recommend the cringe-triggering approach of the fully spiked 90s hairstyle. 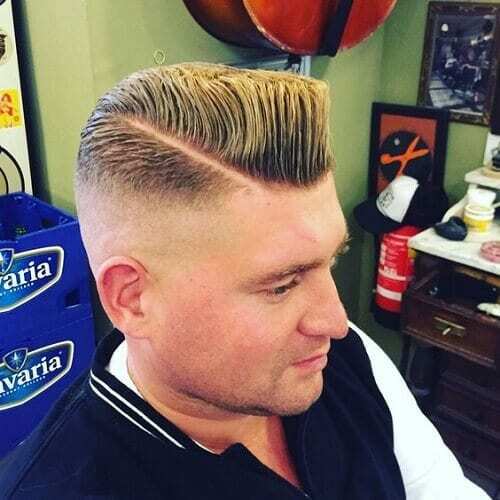 What you can do is gently spike up your pompadour. You won’t always see pompadours with afro-textured hair, but we guarantee that they will take your breath away once you do. 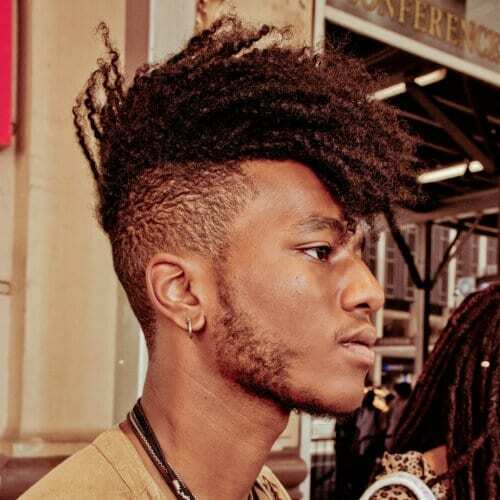 One of the reasons why African American men may avoid this hairstyle is the heavy styling it requires, but we’re sure anyone will be thrilled with the results. 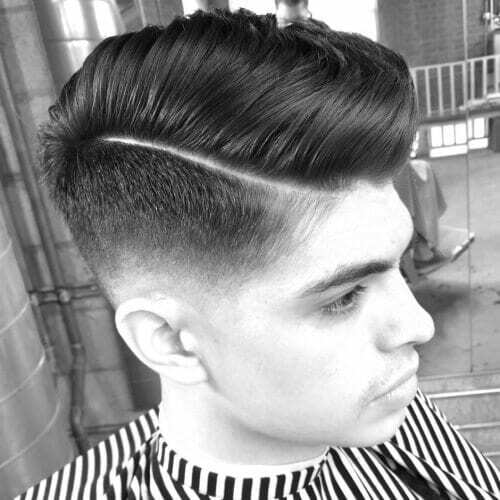 Yet another cool way of styling a pompadour haircut is with the fanned technique. To help you get a better idea about how it’s done, think about the styling done for a punk mohawk. Now, apply that with a subtle touch to your look. In this day and age, you will probably have less time on your hands than ever before. That’s specifically why we encourage you to consider a side-tossed pompadour, for practical and aesthetic purposes alike. We know how difficult it is to deal with receding hairlines, particularly when you reach a certain age. All the same, that should never stop you from exploring receding hairlines hairstyles ideas to flatter your features. The pompadour is the way to go. Not afraid to go the extra mile with your hairstyle? 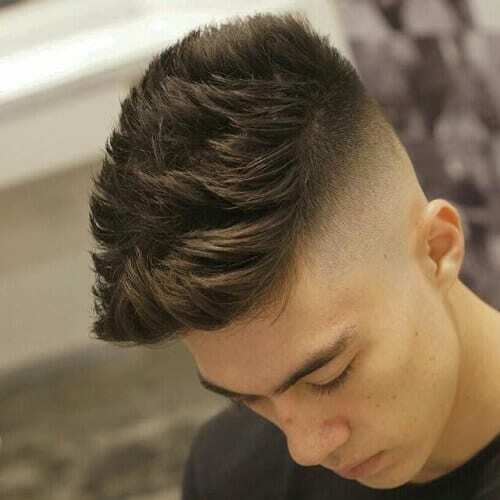 Go beyond a high, medium or low fade with a skin fade pompadour haircut. Like you can guess from the name, this method involves shaving down to your skin in the undercut portion of your hairstyle. If you want to exceed expectations even more, put some thought and creativity into your hairstyle. 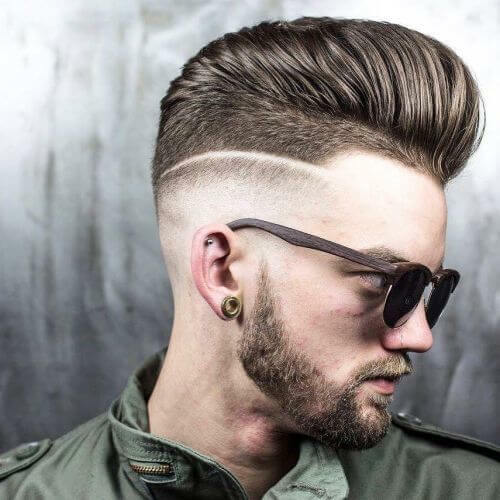 You can start from a pomp-inspired top and then play around with the taper fade area, even adding a shaved line to highlight the differences. While most men focus on the top part of their pompadour for styling, we encourage you to keep the rest of your hair in mind too. 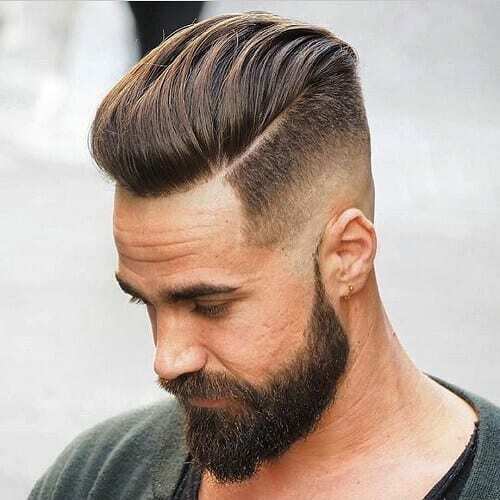 This is the case for men who don’t have a taper fade haircut to go with their pompadour and left their hair longer all around. 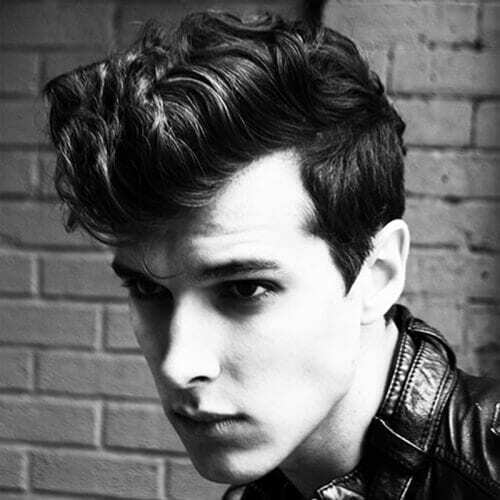 A pompadour haircut like this one is guaranteed to make you the center of attention. 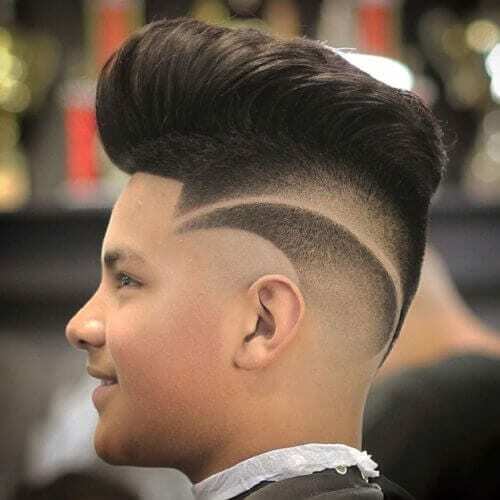 In addition to the smooth temple fade, the hairstyle stands out through the imagination put into the undercut design, with the arched lines and shading. 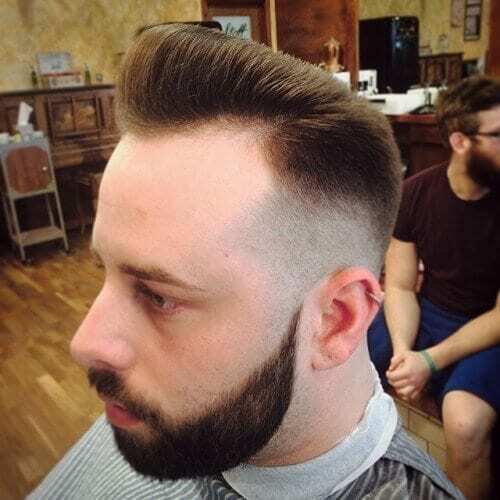 Another pompadour haircut that should be kept in mind by men with receding hairlines is this rounded version. It follows your natural hairline that is brushed up and back, drawing attention away from any potential flaws. Highlights are an exceptional way of adding some flavor to your hairstyle. If you have a larger pompadour, a few highlights sprinkled in the right places can emphasize the volume incorporated into your hairstyle. As you know by now, the undercut that goes with your pompadour haircut deserves just as much thought as the rest of the hairstyle. 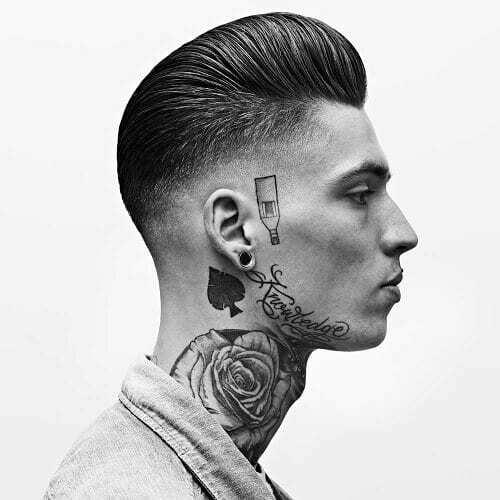 Aside from any taper or fade technique, you can mold your undercut into a popular V-shape. If you are researching hairstyles for your son, look no further. 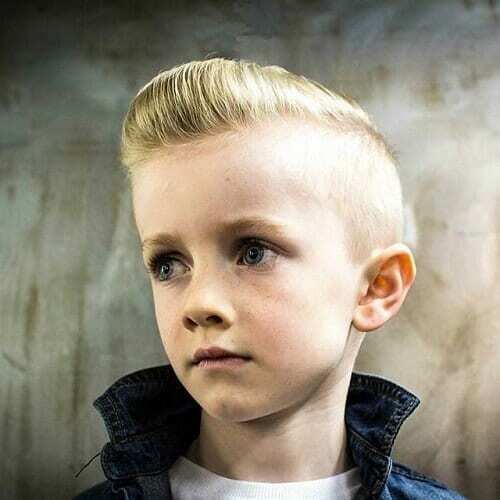 This cute small pompadour will make any boy feel and look like a veritable young man. Whether you’re preparing for a special event or some family photos, you can count on the pompadour for an unforgettable appearance. Speaking of photos, what if you want to step into the world of fashion in the near future? You can awe at any photo shoot with a spectacular pompadour like the one in this example. We do recommend working with a professional hairstylist for your desired results. What better way to end our list of pompadour inspiration than the approach that made the hairstyle famous in the first place? Sleek, smooth and slick are all essential qualities for a pompadour that have withstood the test of time. In conclusion, the pompadour haircut will not be going out of style anytime soon. Although it is a symbol of a previous generation, it remains a powerful statement for the rebellious man who still has amazing tastes. Whether you go for a classic pomp or a messy and modern one, make sure you spice it up with your own attitude. So, how will you rock yours? Let us know in the comment section! 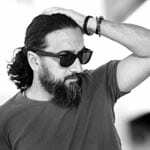 Manuel Santiago is a professional writer passionate about men's hairstyles, grooming, and fashion. He has a soft spot for Viking hairstyles and long haircuts, but he doesn't discredit the beauty of a buzz cut.